After all, if you are going to lead, you need to know where you are going. In order to know where you are going, you need to plan. Difficult concept I know. Yet, I am constantly amazed at how many people do not plan. They run through their day to day lives, going to work, coming home, kissing the spouse and kids; rinse repeat tomorrow. On a larger scale, I see business leaders do this too. 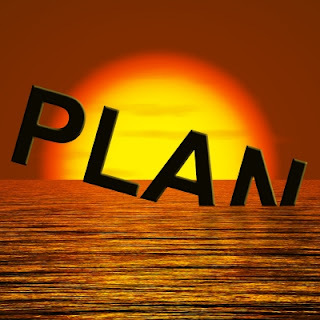 They are so wrapped up in operations, in the day to day, that they are unable to take the time to plan for the future. Then they wonder why they don't hit their numbers. In fact, I know many small business owners and entrepreneurs struggle with this. They work hard all day, into the nights and weekends, and yet they never seem to make headway. Why is this? Because "Planning is hard" or "I'll find time to do it later." The person ends up spending all their time in quadrants 1 and 3 of the Eisenhower Decision Matrix, rather than in Quadrant 2, where the real power is. People are intimidated by planning, and in some cases the intimidation is because they have to put something to paper, and then they have to live up to it! I even suffer from this one, not so much on my professional side, but on my personal side. I have a list of goals I want to accomplish, and I keep telling myself I'll get to the someday. Professional experience has taught me that if I don't put a date to the goal, as well as as have someone who will hold me accountable to it, then the goal is really only a wish. Someday. That's a dangerous word. It's really code for "never"
So what are you putting off to Someday? I may have a way to help. 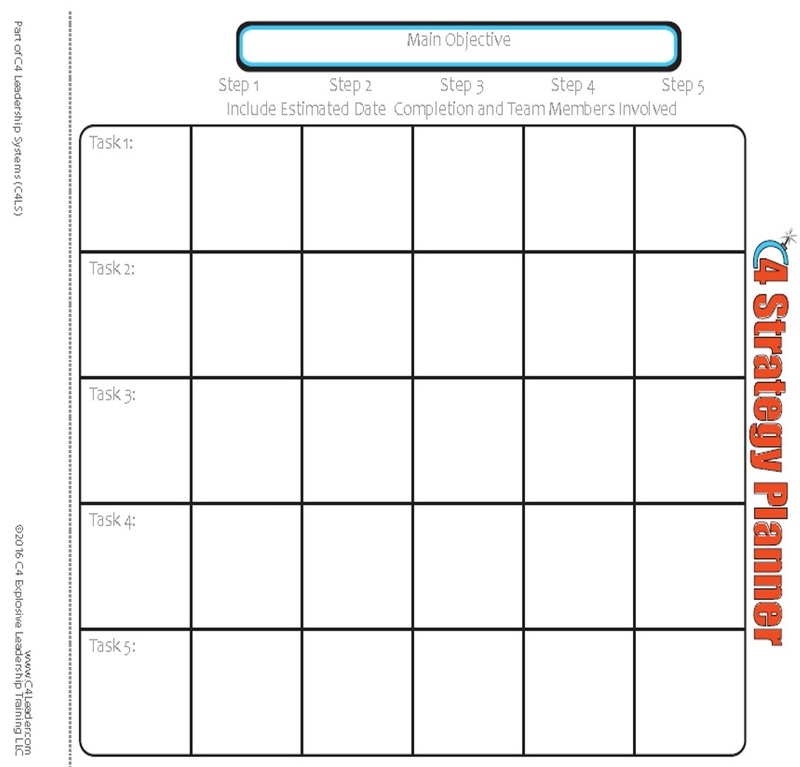 As a Project Manager I've worked with project plans consisting of hundreds if not thousands of tasks (my max is 5,467. What's yours?). These project plans can be overwhelming and complex. In fact most people cannot fathom plans unless they've received some form of training, or worked their way up in difficulty via experience. Throw in Critical Path, Gant Charts, and Resource Leveling, and it's little wonder that people are intimidated! 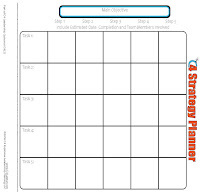 For my readers I am going to share a tool that will make it easier for you to plan. I built it as part of my C4 Leadership System (C4LS), but I think it is applicable here. It's the C4 Strategy Planner. 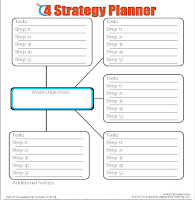 The gist of the Strategic Planner is to take the big goals and break them down into smaller tasks, and eventually steps you can actually take. Start in the Blue Box titled Main Objective: Write out the large goal you want to accomplish for the next period (Month, Quarter, 6 months, year). From there, break the objective down into tasks you need to accomplish in order to reach the goal. Those go in the Task bubbles around the Main Objective. Now take the time to think through the next steps you need to do in order to complete the tasks. Don't be frustrated if you can't think of all the steps necessary to complete the task! J.P. Morgan said: Go as far as you can see; when you get there you'll be able to see farther. Plan what you can and realize that it will need to be adjusted or added to. 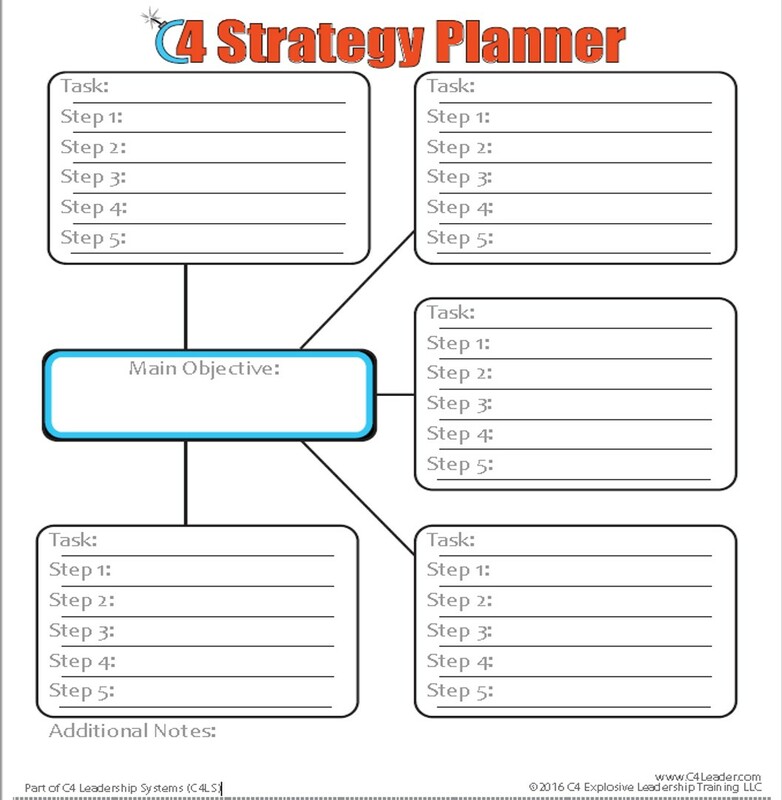 Now that you have your Objective broken down into tasks and steps, go to the second page of the Strategy Planner. Here, is where we start to assign dates and people. Find the blue box again, and fill in your Objective. From there, go to the left hand side and fill in the tasks and steps. In the boxes with the steps, it's time to add dates of completion and (if you have a team) who will be responsible for doing the work. Congratulations! You've just laid the groundwork for your plan. Next steps I would recommend are informing the team of the plan and finding a way to publicize the dates for accountability purposes. A great tactic is a dry erase calendar with the goals written on them. Avoid typing these outs the first time through the process. People respond and remember more when things are handwritten. Hello Friends, How are you Nice http://write-my-essays.org/customwritings-com-review/ post and very help full information for me. Thank you for this post i share this post other peoples.